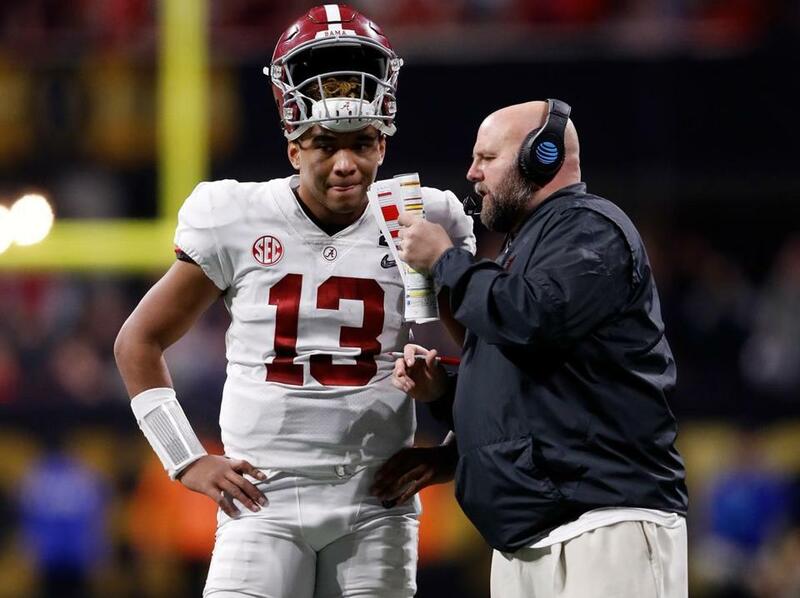 Alabama freshman quarterback Tua Tagovailoa (13) speaks with offensive coordinator Brian Daboll during the second half of the CFP national championship game in Atlanta. ATLANTA — It was halftime at Mercedes-Benz Stadium on Monday night and Brian Daboll, the former Patriots assistant coach, was being fitted for a blindfold, handed a cigarette, and given a quiz. The Alabama offensive coordinator was a Twitter target, not just with fans, but with a certain former Alabama offensive coordinator. “Are we going to actually throw the ball downfield once,” Lane Kiffin piled on with a Tweet. Daboll’s offense was lifeless for one half in the national championship game. The Crimson Tide trailed Georgia, 13-0. There was no nerve, no pulse, no nothing for the Alabama offense with Daboll holding the rudder. Crimson Tide coach Nick Saban won his record-tying sixth national championship. So where had the former New England assistant seen this before? It was 28-3 back 11 months ago when the Patriots stormed back to beat the Atlanta Falcons and win the Super Bowl. 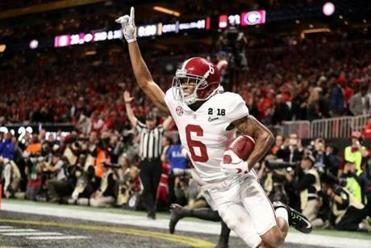 The College Football Playoff national championship game wasn’t as epic a comeback as the Super Bowl last February, but it was surely grand. Alabama changed quarterbacks, from sophomore Jalen Hurts to freshman Tua Tagovailoa, Daboll opened up the offense, and the Crimson Tide roared back to beat the Bulldogs, 26-23, in overtime. Tagovailoa, the backup all season, came off the bench and completed 14 of 24 passes for 166 yards and three touchdowns. The lefthander threw the game-winner down the left sideline 41 yards to DeVonta Smith, which was his only catch of the game. “You don’t flinch, I’ve been in games like this before, you can’t let your emotions get the best of you,” Daboll said. He not only had to rely on a freshman quarterback in a rollicking stadium, but Daboll also called on a freshman running back and three freshmen wide receivers to play crucial roles. The winning play was “4 verticals Seattle.” Down, 23-20, after Georgia ended its possession in overtime with a 51-yard field goal, Alabama faced second and 26. Smith lined up left. Daboll, 42, was surrounded by media after a game. It was hard for him to exhale in the tumult of the postgame. “It’s probably taken some years off my life,” he said of the last 11 months and being a part of two mega-comebacks.